Tue, Sep 11, 2018, 11:25 am SL Time, ColomboPage News Desk, Sri Lanka. Sept 11, Geneva: Newly appointed UN High Commissioner for Human Rights Michelle Bachelet called on Sri Lanka on Monday to expedite the work of the Office on Missing Persons (OMP) and to provide answers to the families of the disappeared quickly. 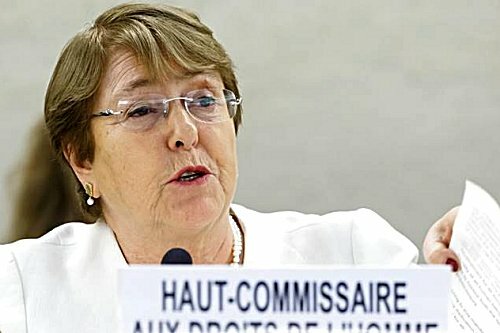 Bachelet, who assumed duties as the UN Human Rights Chief on September 1, making her first speech to the Human Rights Council at its 39th session in Geneva on Monday noted that albeit slowly, Sri Lanka is moving to implement its transitional justice agenda. �In Sri Lanka, although the authorities have moved too slowly towards meaningful implementation of the transitional justice agenda, the OMP has now begun consultations and institutional capacity-building to fulfill its mandate," she said in her opening statement. "We look to that Office to work quickly, to begin to provide answers to the families of the disappeared," she added. The High Commissioner noting that legislation establishing an Office for Reparations is also underway said "More progress in advancing accountability and truth-seeking could have great weight in the long-term stability and prosperity of the nation." However, Bachelet expressed concern over the recent racial violence and Sri Lanka President's move to reinstate the death penalty after a 42-year moratorium. "Recurrent incidents of racist and inter-communal violence are disturbing, as are announced plans to resume use of the death penalty," the High Commissioner said.